“Bullying,” the repeated use by one or more residents or employees of a covered residential community of a written, verbal or electronic expression or a physical act or gesture or any combination thereof, directed at a target who: (i) causes physical or emotional harm to the target or damage to the target’s property; (ii) places the target in reasonable fear of harm to himself or damage to his property; (iii) creates a hostile environment for the target; (iv) infringes on the rights of target; or (v) materially and substantially disrupts the orderly operation of a covered residential community. For the purposes of this section, bullying shall include but not be limited to cyber-bullying, group or social bullying, and mobbing. “Covered residential community,” a public or privately owned multifamily residential housing development subsidized in whole or in part by the United States Department of Housing and Urban Development or the commonwealth and serving elderly persons aged 55 or older or persons with disabilities. “Cyber-bullying,” bullying through the use of technology or any electronic communication. Cyber-bullying shall include (i) the creation of a web page or blog in which the creator assumes the identity of another person or (ii) the knowing impersonation of another person as the author of posted content or messages if the creation or impersonation creates any of the conditions enumerated in clauses (i) to (v), inclusive, of the definition of bullying. Cyber bullying shall also include the distribution by electronic means of communication to more than one person or the posting of material on an electronic medium that may be accessed by one or more persons, if the distribution or posting creates any of the conditions enumerated in clauses (i) to (v), inclusive, of the definition of bullying. “Department,” the department of housing and community development. “Group or social bullying,” is the attempt by several persons acting together to engage in bullying conduct toward one or more targets by intentional, repeated, aggressive speech or action capable of causing harm. “Hostile environment,” a situation in which bullying causes the residential environment to be permeated with intimidation, ridicule or insult that is sufficiently severe or pervasive to interfere with a resident’s quiet enjoyment of tenancy or rights as a tenant. “Mobbing,” is bullying that owner/managers or employees condone or take part in with the purpose of demeaning the target and excluding the target from the social life, quiet enjoyment of occupancy, or occupancy status in a covered residential community. “Owner/manager,” the owner of a covered residential community or the property manager or management agent responsible for overseeing a covered residential community. “Perpetrator,” a person who engages in bullying or retaliation, or an owner/manager whose employees engage in, support or condone bullying, group or social bullying, or mobbing. “Protective service agency,” an entity that provide services necessary to prevent, eliminate, or remedy bullying, harassment, mobbing, and hostile environment harassment on an elderly person or a person with disability including, but not limited to, mental health, support and advocacy services, and community organization services. (b) The department, subject to appropriation, shall establish a statewide tenant protective services ombuds program to provide resources to targets of bullying in covered residential communities, including legal and other recourses available to targets of bullying and information on relevant protective services agencies; monitoring and ensuring compliance with relevant statutes, regulations, rules and policies pertaining to bullying in covered residential communities; and receiving and referring complaints of bullying to the proper enforcement authority. (c) The ombuds shall maintain and staff a hotline to receive reports of bullying in covered residential communities. The hotline shall include, but may not be limited to, a monitored telephone line, a monitored email address, and a monitored postal service address. Reports of bullying received by the hotline shall be reviewed by and responded to in a timely manner. 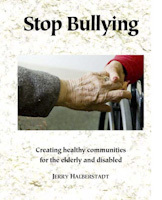 (1) Any person may file a complaint of bullying where there is reasonable cause to believe that an elderly or disabled person is suffering from bullying; has died as a result thereof; has been or is threatened with unfair or illegal eviction; or is experiencing hostile environment. (2) No person making a report shall be liable in any civil or criminal action by reason of submitting a report if such report were made in good faith; provided, however, that no person who abuses or bullies a targeted person shall be exempt from civil or criminal liability by reason of reporting such abuse. (3) Any person who makes a malicious and false report shall be punished by a fine of not more than five hundred dollars. (4) Any person who seeks to prevent good faith reports or to retaliate against a person who makes or assists another in making such a report shall be punished by a fine of not more than five hundred dollars. A victim of such interference or retaliation may file a complaint with the tenant protective services ombuds and shall be protected from retaliation. (d) Owner/managers and employees shall report all instances of bullying to the tenant protective services ombuds program. (e) The ombuds shall keep a record of all complaints of bullying received. Upon recognition of a pattern or practice of bullying by a specific individual or at a specific covered residential community, the ombuds shall refer the matter to the office of the attorney general. (f) Owner/managers shall provide written notice to all tenants of their right to be free from bullying and harassment. Such notice shall include the definition of bullying, the legal and other recourses available to targets of bullying, and the tenant protective services ombuds hotline information. (g) The department shall promulgate regulations for the enforcement of this section. Source: https://malegislature.gov/Bills/191/SD2195 NOTE: The current number of the bill is S985 and it is assigned to Housing.